Stoke on Trent including Newcastle & Staffs Moorlands. All of our volunteers that contribute to service delivery have completed Changes’ accredited training course. The course runs twice a year from each of our Wellness Centres, and is accredited to levels 2 and 3 by The Open College Network West Midlands. Before each run of the course, there will be an Open Day where you can find out more about the course, it’s benefits to you, and the commitment required. Changes are looking to recruit enthusiastic and committed volunteers of all ages to enrol on their FREE Coordinators Training Programme. 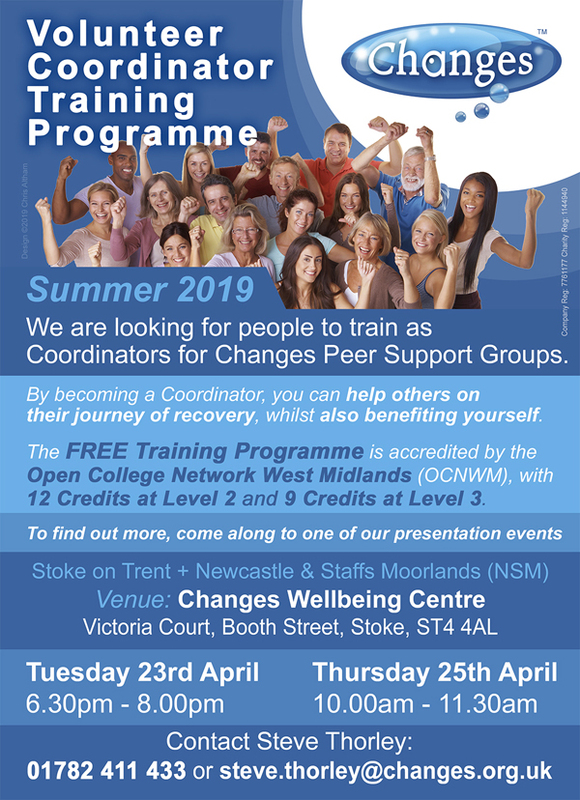 Volunteer Coordinators are required to deliver Changes' recovery focused Peer Support Groups for adults who are experiencing mental distress. Anyone who feels that they are able to encourage and support people in this challenging and rewarding area would be suitable - especially those who have personal or secondary experience of mental distress. In addition to being personally rewarding, training as a Volunteer Coordinator provides certificates and credits (12 at level 2 and 9 at level 3) with the Open College Network West Midlands Region. As well as Coordinating and Assisting Peer Support Groups, there are also a variety of volunteering opportunities at a later date if learners wish.